Our Tallow Balm makes an excellent small but valuable gift to give to everyone on your list this holiday season, and that includes our Balm Samples and Tube Tallow Balm. They are all perfect as stocking stuffers. Be sure to check out our quantity discounts. "I'm going to use Vintage Tradition Tallow Balm for stocking stuffers and some to have on hand for hostess gifts for holiday parties and a few for small birthday gifts when I'd like to give something but don't want to spend a lot of money. It's nice to give something unique, something that people need, and something that I believe in and can feel proud and good about giving." If you like, we can ship your gift directly to the recipient. You can include a gift message on your order, in which case we won't include an invoice. 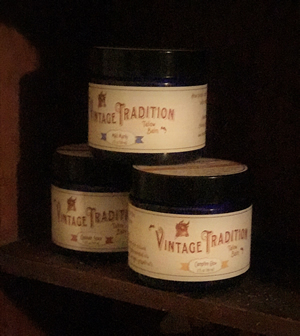 Order Vintage Tradition Tallow Balms as gifts here!